Who would have thought we’d be burying that man a week later. All those words … and now … just silence. Life plays along to an unheard rhythm. We always kidded that his death would somehow involve pyrotechnics. We should have known each time the story was told of that time in his thirties when he poured five gallons of gas on a giant brush pile in his yard. His plan was to let it burn down, then roast hot dogs for all the guests at his party. Knocked him over, singed every hair on his head – and from twenty feet away. ‘Almost burned the house and woods down!’” This time it was fatal. Eleven or twelve years ago, back when his English Setter, King Henry, was a pup, Pops was walking him along the creek that runs through his fifty acres. Some beavers had damned up the creek again and Pops was, once again, clearing it to let the water pass. On this particular day, the pup stumbled on a big fat beaver they came to refer to as “Snaggletooth”. They called him that because he was missing one of his two cutting teeth and – the remaining one was chipped. That beaver must have had a harem supporting him because it didn’t seem he would be worth a hoot when it came to falling trees. But when King Henry poked his nose right in that beaver’s face, that missing tooth didn’t stop Snaggletooth from ripping a long and jagged gash in King Henry’s muzzle. Sixteen stitches later they left the vet’s office and Pops and King Henry made a pact that, one day, they would get that beaver back for what he did to “Henry”. Ever since, until last week, they had schemed and plotted, devised and tried, but had been unsuccessful in effecting the demise of that wily rodent. Sometimes I believe it was just being together and the sheer joy of the pursuit, more than the stated objective, they enjoyed. They tried innumerable traps, lures and “beaver calling” devices. 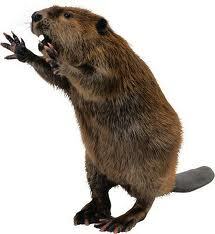 For the life of me, I still don’t know what sound a beaver makes. Pops never shared that secret with me. But, whatever it was, Snaggletooth wasn’t biting. One night, in a moment of liquid campground inspiration, and to the total delight of myself and numerous cousins sharing the fire with him, he wired a beaver pelt to his old barn cat and rubbed beaver scent all over him. Supposedly it was the beaver equivalent of Chanel #5 – the scent of a beaverette in season. This was Pop’s description – not mine. I don’t know what that cat thought of it all, but the sight of Pops carrying a fishing net following him around in the moonlight must have sucked all nine of his lives right out of him. We found him dead behind the barn not long after. Pops said he was the victim of a violent love triangle! A classic “Pops” story if ever there was one.Pops claimed he wanted to take Snaggletooth alive – so that he could tell him to his face what a fine hat he was going to make of him. But – to no avail. I can’t tell you how many young, less cunning, beaver Pops set free over the years. He deemed a sniper shot from a long rifle – too easy. And poison – totally unsporting. And so, with the years passing and King Henry getting so old Pops thought he might never live to see the day they got their nemesis – Pops decided to ratchet the action up a notch. Who would have thought that dynamite his brother Mark had brought home from a construction job and given him, over twenty years ago, would still be good. I got the message from the Constable. Seems the explosion was so loud they heard it two miles away at Parson’s Feed & Seed and called for someone to investigate … They had a good idea where to look. I was the first family member on the scene. So glad it was not my mother. From the empty crate resting on the bank of the creek, we determined that Pops and King Henry had planted the entire box of dynamite in the middle of that beaver dam. There was now a pool the size of Lake Maxinkuckee where the dam had been and debris was scattered everywhere. Pops had been blown back and down a ways from the crest of the creek bank. He lay peacefully, almost posed, looking straight up at the blue fall sky. A most unnerving but – when recollected – strangely amusing, little smile curled his mouth. A six inch piece of hickory had pierced his heart. We loaded him into an ambulance before my mother arrived. As it pulled away, King Henry chased behind it, making a sound that was less a bark than a mournful, moaning howl. I turned my head over my shoulder for one last glimpse of the scene. I swear I saw a lone beaver peering from behind some brush. I’m sure Pops would have saluted him. We had the funeral at Jackson’s funeral home in Rensselaer, his birthplace. It was the place we had the funerals of his mother and her parents – Grandpa Frank and Grandma Jessie (the latter for whom Pops had named my mother). Pops looked comfortable in his Irish tweed jacket. No matter the latest mortuary techniques, that undertaker – another in a long succession of Mr. Jackson’s – could not erase that wry smile from Pop’s face.